In this age of information, there is no shortage of opinions. I have my own, in fact. You probably have yours. What if my opinion is different than yours? Does that mean one of us is wrong and one of us is right? Maybe, but most likely it means we have different perspectives, goals, and experiences. The trouble with the internet is that no matter what you believe, you can likely find thousands (or millions) of articles to support your claim and another thousand (or million) that will dispute it. If you want to believe that a low carb diet is bad for your health, a quick Google search will reveal the part of the population that agrees with you. If you want to believe that's it's optimal, you can find supportive evidence of that too. These days, it's not that we don't have the information, it's that we don't know how to cull it down and apply it in our own lives. It can all be so confusing. One study says that coffee is good for your health and another says it may cause cancer. One article says HIIT training is the best method for fat loss and another says it can be dangerous for the general population. Who's right? As a trainer, I am often asked to comment on certain diets, foods, and exercise plans. "What do you think of the cabbage soup diet?" "Is Keto good for fat loss?" "My bodybuilder friend is going on a one-week hard-boiled egg and tuna fish diet, should I try that too?" "Is wheat bread good or bad?" "Should I try intermittent fasting?" "Will apple cider vinegar melt belly fat?" "Is it safe to try this juice fast?" "My friend lost eight pounds on a cleanse, should I try this too? 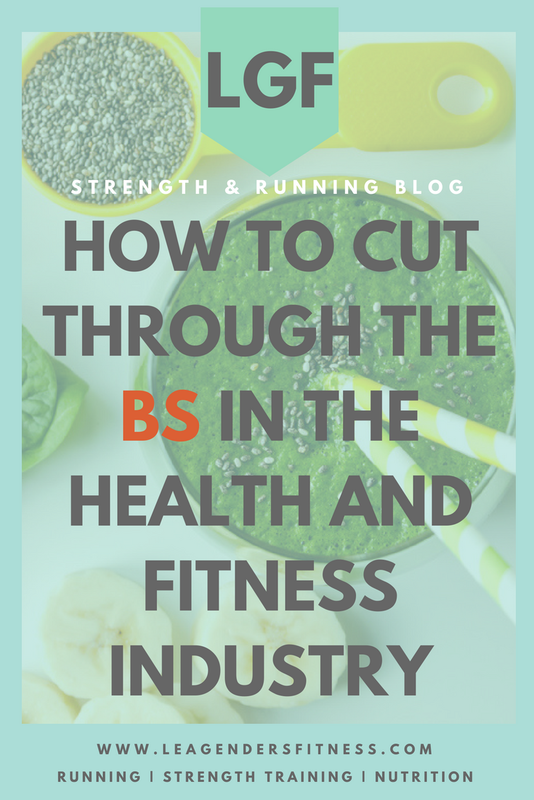 How to cut through the BS in the health and fitness industry. Save to your favorite Pinterest board for later. While I always recommend sticking to the basics of long-term health: exercise, whole-food nutrition, rest and recovery, It seems we are all looking for an edge. I'll admit that I sometimes get sucked into it myself, by clicking on an article on Pinterest on how to get six-pack abs in four weeks..and I know better. It's not about seeking out more information to support what we want to believe, but about asking the right questions to uncover the truth as it applies in our own lives. When considering a new program, diet or supplement, I would first advise reframing the question 'Is it good or is it bad?' Except for maybe murderers (bad) and unicorns (good), most choices aren't so black and white. Almost nothing is all good or all bad. The key is to figure out where it falls on the spectrum, weigh the possible benefit against the possible risk and make the best choice for your own life. The truth is we are adults capable of weighing the pros and cons and make the most appropriate choice for ourselves. We have to put aside what we want to believe (quick fixes, magic shakes, and miracle exercise programs) and be open to understanding the truth. Once I work through these questions I am better able to cut through the BS in the health and fitness industry. We all want to believe that we can get six pack abs in four weeks, or take a pill that will melt our fat or drink a protein shake that will add muscle like spinach does for Popeye, that we are often willing to overlook the facts. Apple cider vinegar probably isn't going to melt your body fat, but is there any harm in experimenting? Probably not. Is it effective? Unfortunately, also probably not. If you feel it is worth your time and effort to try it, then you're an adult capable of making that decision for yourself. I just ask that you look at it as an experiment and keep track of your progress and results including how you look, feel and perform throughout. The faster you figure out what doesn't work for you, the sooner you can move on to what will. If you approach it as an experiment and you don't get the results that you hoped, you can use that feedback to start to figure out why it didn't work for you to better understand what will. Often we tend to blame ourselves, "I didn't have enough willpower" but the truth it's often the program itself, not your execution of it. Your diet and exercise plan must fit into the context of your real life or it will never work. For example, if you did decide to try to the cabbage soup diet, but an old friend asked you to go to lunch, your husband wanted to go out to eat to celebrate a promotion at work and your best friend had a birthday party, you may start to realize that such a restrictive diet will likely never work in your life. It's not that you didn't have enough willpower, it's that you have a vibrant life full of friends and family and spending time with loved ones is as important (or more!) than cabbage soup. You didn't fail. The diet failed you. Now how can take this information to learn how to better achieve balance in your life? Be open to experimentation, be wary of quick fixes and keep chugging forward in your journey to discover what works best for your individual body and lifestyle. One more thing before you go. If you are reading this in real-time, I have an Instagram contest going on that ends today 6/18. Click over to Instagram to enter to win these cool fitness dice.